The Football Camp for our international guests in Germany. The international football camp is for enthusiastic football players from all over the world. 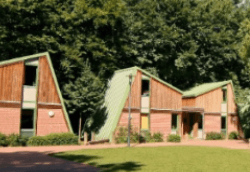 Come and visit our football camp in Germany and have a great experience in our camp, which takes place in the beautiful sports village in Hinsbeck. During this camp our kickers practice their skills up to three times per day. Sport-specific and pedagogically qualified coaches, coupled with high-quality facilities, guarantees endless football fun and successful learning. Our young kickers will not only work on techniques such as dribbling, passing and shooting, but will also be able to show their footballing talent in many game-based and tournament formats, as well as the FERIENFUSSBALL-Football-Test. 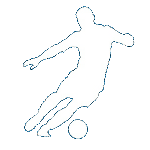 Players will be shown tricks inspired by the professionals. They will also be trained physically, with coordination technique being worked on. Additionally, there will be leisure time where we could watch the favoured Scouting Game in the cinema room. Furthermore you have the opportunity to play table tennis, beach volleyball or team building games in the outdoor area. A daily ´press-conference´ will also be held to decide who deserves the title ´Player of the Day´. Although the camp is for both native and non-native speakers, it is held purely in English. In order to pick up some German football phrases, a German ´crash-course´ will also be offered during the first week. Make new friends from all over the world! Enjoy football, learn from our coaches and have a lot of fun in doing so! 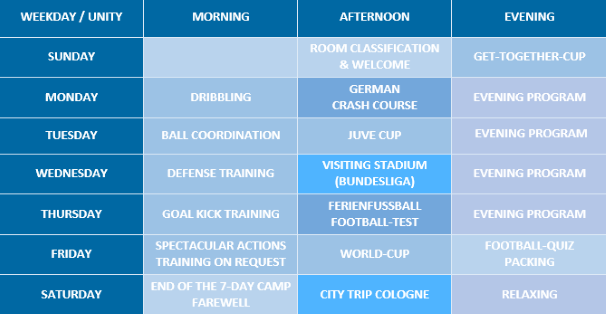 Come and enjoy your football-holiday in Germany! You can choose between a 7 day or a 14 day camp stay! If you like football and England, have a look at our camps in Framlingham or Worksop in the UK. Arrival 4:00-5:00 pm and departure 9:00-10:00 am. Arrival/departure on your own or by shuttle service from train station Cologne Trade Fair “Köln Messe/Deutz” (45€ extra) or from Cologne Airport „Köln/Bonn Flughafen“(70€ extra). We will separate the participants in age-based groups, depending on the level of participants. If you are travelling with a friend, it is no problem to stay with him/her in a room. Please, just let us know when you sign up. Generally we recommend an early arrival. In addition we refer to our Information obligations about travel requirements, cancellation policies and reduced mobility. Please note that it is mandatory to book a foreign travel health insurance for your stay at the football camp in Germany, unless you are a EU citizen with a European Health Insurance Card (EHIC). You can book it by yourself or our partner Hanse Merkur Reiseversicherung AG. Please send us a copy of your foreign health insurance until 14 days before camp starts. Through the registration process you have the opportunity to add a travel cancellation and travel interruption insurance to your booking. Information according to § 66 VVG for the brokerage of travel insurances you can find in our Impressum. Football-Holiday Program: This initial program is an example for the 7-day and 14-day camp and will be altered in accordance with the needs of the groups and the weather conditions. During evening breaks, different sports such as table tennis, basketball and dodgeball can be enjoyed, alongside our favorite football-camp scouting-game ´Pinnekken´. We also offer evening goal-keeper and free-kick training, together with football quizzes. Or, you can just sit back and relax! Every evening, following the ´Player of the Day´ award, the ´press-conference´ will consist of a daily review and announce plans for the following day. Our ‚Ferienfussball‘ sports camps take place in different locations and accommodations throughout Germany. Below you will find a short description of the sports village in Hinsbeck, our location for the International Football Camp. Hinsbeck is a small town in western Germany, about one hour and a half away from Cologne. The sports village is a certified accommodation and offers perfect conditions for our football camp. Little on-site houses (8 bed houses) ensure plenty of space for our participants. Every house has its own shower, washroom and toilet. The young kickers will sleep in comfortable bunk beds and have plentiful cupboard and shelf-space to organize their belongings. Training will be held on artifical-grass field, in the sports hall or on the ’street-soccer‘ pitch. Beach volleyball, coordination parcours, a cinema-room are all part of the leisure program. The meals are buffet-style, catered to dietary-requirements (that are previously disclosed). Further information and pictures of the accommodation are accessible unter sports village Hinsbeck. I have talked to Hizuki and received his comments. He liked and enjoyed the camp very much and he would love to go to the camp again in the future. All the coaches were friendly and supported him through out the camp. 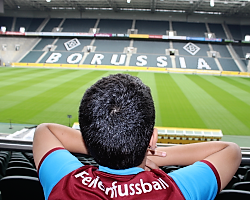 my son was very happy when I picked him up from camp and hopefully we will be in Germany next year again. Thank you for everything! although the accommodation changed, it was well organised and my son and his friends could enjoy the camp. Here you’ll find every feedback from the last years‘ camps.